The Real Housewives Of New York never fail to disappoint! They cycle through emotions faster than teenage girls, even though they’re all, for the most part, menopausal women. We open in the Berkshires where Sonja Morgan is having a meltdown over Dorinda Medley touching the sacred MOOOOOORGAN LETTERS, which really should be under plexiglass like the Guggenheim Bible and the first thong Sonja ever washed in her bidet. “She didn’t desecrate them!” Ramona Singer yells in an attempt to calm Sonja down, but Bethenny Frankel is the expert in psychotic breaks. Bethenny has a lifetime of experience, after all, so she ushers Sonja out of the room, grabs her face, and performs an exorcism. I also think Bethenny must have hypnotized Sonja with one the 32 diamond rings she’s wearing, because from that moment forward Sonja became obsessed with The B. Back at the table, Sonja is ready to resume partying. Everything’s fine! 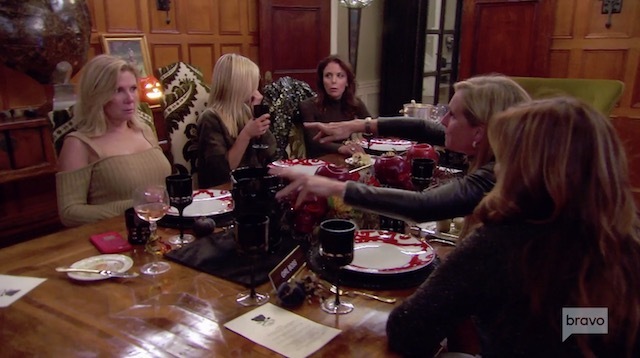 Dorinda Medley tried to make Bluestone Manor scary but “nice” for Halloween on the Real Housewives of New York. That ranged from peeping vampires, a Morgan mansion tour and a naked chef. Much to Dorinda’s annoyance, her costars thought sleeping in the fish room was the scariest thing about the manor. The room assignment passed around like a hot potato. Ultimately, newcomer Barbara Kavovit was left holding it. 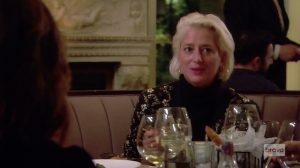 The second scariest part was Sonja Morgan’s drunken meltdown at dinner, which was provoked by Dorinda manhandling some Morgan artifacts during their visit to Ventfort Hall. As an avid Real Housewives of New York fan, I live for the annual trip to the “Bezerkshires.” Dorinda Medley made Bluestone Manor “nice” for Halloween with crazy and gory decorations, including a peeping vampire. Dorinda booked massages and yoga to please Luann de Lesseps. Dorinda dealt with Bethenny Frankel insisting on having the best room in the house. She endured her guests fighting over who had the pleasure misfortune of staying in Dorinda’s expensive fish room, where you literally sleep with the taxidermy fishes. After much squabbling, that honor went to RHONY newbie Barbara Kavovit. Even though Dorinda Medley is housing everyone for free and providing yoga, massage therapists, naked chefs, and Morgan mansion tours, the Real Housewives of New York ladies couldn’t help being demanding. No one wanted to sleep in the fish room at Dorinda’s Berkshires house- literally because of the decor. It isn’t in an undesirable location of the house. It has central air conditioning and heating. Oh, and it’s a room in a mansion. Who really cares about what’s on the wall? Apparently everyone. Luann de Lesseps, Ramona Singer, Sonja Morgan, Tinsley Mortimer, and Barbara Kavovit didn’t want to sleep there. During last week’s episode, Luann stormed out of dinner just because she didn’t want to sleep in that room. Bethenny Frankel even called ahead to make sure that she got to sleep in the “second best room” in the Berkshires mansion. During the next episode, Bethenny insisted that she would have no problem switching rooms with Luann if she texted her to ask about it. That’s easy to say about a hypothetical scenario. Does anyone believe that Queen B would really give up the (supposedly) superior room? The cast of the Real Housewives of New York has departed the Hamptons for Dorinda Medley’s Blue Stone Manor in the Berkshires. Dorinda really did try and make it nice. That included a field trip to a historic Morgan House for Sonja Morgan’s sake where Dorinda casually touched some of the artifacts much to Sonja’s dismay. Sonja still regrets the end of her dynastic marriage. So after they return to the lesser manor, she starts drinking like she’s making up for Luann de Lesseps. Drunk Sonja greets newcomer and latecomer Barbara Kavovit outside where in addition to insulting Dorinda’s apartment, Barbara hates on the fish room before setting foot inside. It’s not a great look on a houseguest. Or a new cast member. I’m beginning to think that next time, instead of going to The Berkshires, the Real Housewives Of New York all just need to take a trip to rehab. I’m sure Luann de Lesseps knows a place! Dorinda Medley thought she was making it nice by decorating her house like cheesy haunted house, but the Fish Room is no halloween theme! Those are $15,000 taxidermied sword fish (why? how? so confusing?) and it’s a privilege to pass out drunk before their glassy-eyed stare! Also they are there all. year. round. Come Easter they wear bunny ears, come Christmas twinkly lights, come St. Patty’s day a leprechaun hat, but come Halloween they get to just be their creepy selves. Kinda like the Real Housewives when they enter the Berkshires – all their most idiosyncratic tendencies and behaviors come out in full force and they are their most selves. Take Luann for instance, throwing a haughty fit after learning she was placed in the Fish Room instead of ‘Hannah’s room’ at the front of the house. On the Real Housewives of New York this season, Dorinda Medley is willing to do everything but apologize to Luann de Lesseps to make it nice. So for the cast trip to the Berkshires, Dorinda arranged yoga for Luann at Luann’s request. Luann also wanted a massage, which Dorinda says she’ll handle. All of Dorinda’s hospitality is for naught, however, when Luann learns she’s sleeping in the fish room, where she’d last awoken with an epic hangover. Watching Luann’s reaction makes Sonja Morgan and Ramona Singer cackle like hyenas. If there’s one thing viewers can always count on with Dorinda Medley, it’s that she tells it like it is. What the Real Housewives of New York star can’t seem to do, however, is admit any wrongdoing. Even when it’s caught on camera, ahem…Jovani! Her relationship with Luann de Lesseps unraveled last season during the nightmare cast trip to Columbia. 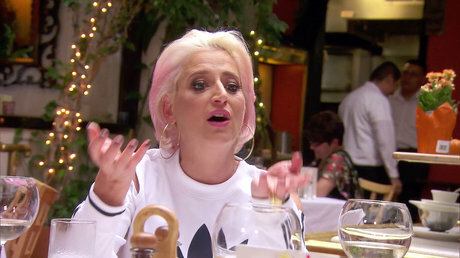 A drunken Dorinda mocked Luann for her arrest, and Luann pretty much called her an alcoholic. Now this season, Dorinda wants to make amends.